We wrote a book that you’re definitely going to want to read. Seriously, it gives businesses everything they need to know about digital marketing. 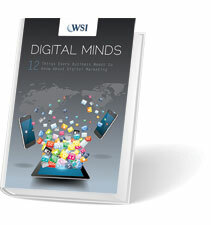 No, really, it’s called Digital Minds: 12 Things Every Business Needs to Know About Digital Marketing. Each chapter covers a different digital marketing tactic and is written by an expert (or ninja, or wizard) on the particular topic. It’s the perfect resource for people and businesses who want to delve into digital marketing.